My family and I have been gone for days, sixteen to be exact. Although I love being here in Denver, I am ready for my own bed, my own refrigerator and my own dog. I adore my family and my friends. I will miss them until next time. But for now, I am ready for home! 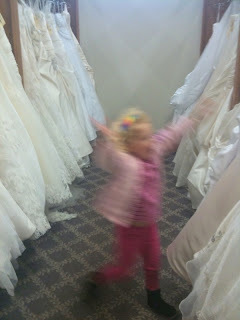 Side note: While in Denver, I went to few wedding dress appointments at various bridal shops around town. No, not for me as I am already married, but for our great friend, Auntie J. We had a blast, and although I never felt like I was on Say Yes to the Dress, it still was quite overwhelming. Just look at Lilly, she couldn't contain herself long enough to stand still!